Born as Óscar Arístides Renta Fiallo on the 22nd July 1932, and having died on the 20th October 2014, he was a Dominican fashion designer, known by the name of Osccar de la Renta. He is most famous for working for Jane Derby, and later taking over the fashion label. He collaborated with Balmain, becoming the first Dominican designer to work with the French fashion house. His career started in the 1960s, and was active until his passing. 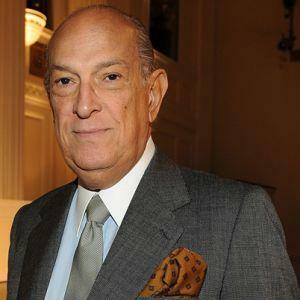 Have you ever wondered how rich Oscar de la Renta was at the time of his death? According to authoritative sources, it has been estimated that Renta`s net worth was $200 million, an amount he acquired through his involvement in the fashion industry as a designer. Oscar grew up in Santo Domingo, the only male child of seven siblings. His parents are of rich heritage; his father`s great-grandfather, Jose Ortiz de la renta, was the mayor of Ponce, a city in Puerto Rico, and his mother came from a family of doctors, lawyers, poets, teachers, and other different academic citizens. When he was 18, Oscar left his home country, and moved to Spain, and enrolled the Academy of San Fernando, in Madrid. While there, Oscar became fascinated by fashion, and began to draw clothes which were then published in some of the most notable Spanish magazines and newspapers. Little by little he became noticed, and started working for Cristóbal Balenciaga. Afterwards, Oscar moved to Paris and worked with Antonio del Castillo for a short time, at Lanvin. Afterwards, he moved to New York, and worked for Elizabeth Arden for several years, before he joined Jane Derby, and her fashion house. However, Jane died in 1965, and Oscar took over the operations of the fashion house, becoming its chairman in 1974. Since then, his career and his net worth went only upwards, until his death. Apart from the clothing line, he also launched the perfume line called OSCAR, which later expanded to homewares and accessories lines, which also increased his net worth. Over the years, he became more focused on bridal wears, and he designed clothes for numerous famous stars, including singers, actors and royalty as well. Thanks to his long and successful career, Oscar received numerous prestigious awards and recognitions, including the Coty Award, in 1967 and 1968, and he was inducted into the Coty Hall of Fame in 1973. Furthermore, he won the American Fashion Critic’s Award, and served as the President of the CFDA on two mandates, from 1973 to 1976 and 1986 until 1988, and received the Lifetime Achievement Award from CFDA. Oscar served as a board member of the Carnegie Hall, Metropolitan Opera and also WNET, and also worked with several charity organizations, including America`s Society, and New Yorker`s For Children, among others. Regarding his personal life, Oscar was married to his second wife Annette at the time of his death; the couple married in 1989. His previous marriage was with Françoise de Langlade, a magazine editor, from 1967 until her death in 1983. Oscar died of cancer in 2014, at 82 years old. He was first diagnosed with cancer in 2006, however he managed to beat the disease, but it later returned and took his life. 1 My customers are successful workingwomen. 2 Online media is increasingly influential in fashion. 3 I was surrounded by sisters. My childhood was all women. 4 Although I have no plans to tweet, I am fascinated by developments on the Internet. 5 If you want to establish an international presence you can't do so from New York. You need the consecration of Paris. 6 Every season I am inspired by women. 7 I do not have one theme for each season, I just try to make beautiful clothes all year round. 8 Regardless of how good or bad a collection might be, it's a letdown after the show is over. It's done. Something you've worked on for months is just over. 9 We're dealing with sophisticated customers. What's most important to these women is individuality. I have to create things she'll want to wear, no matter who she is. 10 I wanted this, I wanted to do this, but my work is me, and it has to be right. 11 I don't really know how to do casual clothes. 13 Gardening is how I relax. It's another form of creating and playing with colors. 14 I am not interested in shock tactics. I just want to make beautiful clothes. 15 Now is the most exciting time in fashion. Women are controlling their destiny now, the consumer is more knowledgeable, and I have to be better every single day. 16 I'm a very restless person. I'm always doing something. The creative process never stops. 17 There is always an emotional element to anything that you make. 18 I want to make clothes that people will wear, not styles that will make a big splash on the runway. 19 I like light, color, luminosity. I like things full of color and vibrant. 20 Fashion is about dressing according to what's fashionable. Style is more about being yourself. 21 The great thing about fashion is that it always looks forward. 22 The qualities I most admire in women are confidence and kindness. 23 I always say: To be well dressed you must be well naked. 24 We live in an era of globalization and the era of the woman. Never in the history of the world have women been more in control of their destiny. 1 Pictured on a 250p Dominican Republic commemorative postage stamp issued 13 October 2015. 2 Maintained homes in Manhattan, New York City, New York, USA; Kent, Connecticut, USA; and in the Dominican Republic, the country of his birth. 3 Designed gowns worn by First Ladies of the United States beginning with Jacqueline Kennedy, and including Lady Bird Johnson, Pat Nixon, Betty Ford, Rosalynn Carter, Nancy Reagan, Barbara Bush, Hillary Clinton, Laura Bush, and Michelle Obama, an unbroken string of ten presidential wives in a row. 4 Had step-children from both of his marriages. 5 Adopted son, Moises de la Renta, with his second wife, Annette Reed de la Renta. 6 Although born in the Dominican Republic, he is half-Dominican (on his mother's side) and half-Puerto Rican (on his father's side). As a result of his father's nationality, he was an American citizen, and lived most of his adult life in the United States.